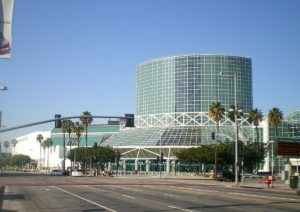 The Los Angeles Convention Center (LACC), owned by the City of Los Angeles and managed by AEG Facilities, is proud to be the first convention center in the United States to permanently install a 5G wireless network. This cutting-edge technology was deployed at the LACC in conjunction with the “GSMA Mobile World Congress Americas, in Partnership with CTIA” on September 12-14, 2018. 5G is the fifth generation of wireless internet and voice services, improving on 4G LTE that currently accounts for around three-quarters of total mobile connections in the U.S. (excluding licensed cellular IoT). 5G will move data faster and be more responsive, dramatically increasing wireless speeds and capacity to transform services such as AI, VR, and video calling. It will facilitate additional technology uses including improved Internet of Things, autonomous vehicles, smart cities, and more. Launching a powerful 5G network enables the next level of technology, as showcased in demonstrations at the 2018 Mobile World Congress Americas, a three-day conference and exhibition convening the mobile ecosystem and its adjacent industries.